National Labour Relations Board, an independent government agency tasked with investigating unfair labour practices in the US, has found “merit” in certain charges against $16 billion “co-working” startup WeWork. The charges were brought by former WeWork employee, Tara Zoumer, who alleges that she was fired after flagging potential labour violations and refusing to sign an arbitration agreement. Zoumer also filed a lawsuit against WeWork in San Francisco Superior Court, which has since been ordered into arbitration in New York. WeWork will have the opportunity to settle the matter before a formal complaint is filed by the NLRB. “The goal is always to reach a settlement that is acceptable to the charging party, the charged party, and the Agency,” according to the NLRB. WeWork has until Friday to counter. Zoumer worked for WeWork from March to November 2015, as an associate community manager, during which time she alleged violations of California’s labour code, including a lack of overtime and meal breaks due to a misclassification. When she brought these issues up with her managers at WeWork, she was told to not talk with her coworkers about them, and then asked if she wanted to resign, Zoumer says. Zoumer says she was fired by WeWork after refusing to sign this agreement, which would have waived certain rights, including her right to a class-action claim. These kinds of arbitration agreements, especially those that strip class-action rights, are controversial. The NLRB considers them to be in violation of the National Labour Relations Act, but there have been conflicting rulings from the courts. A person close to WeWork, who asked not to be identified discussing a legal matter, said that though the majority of federal courts were on WeWork’s side — in favour of these arbitration agreements — this fight could eventually go to the Supreme Court because of the differences in lower court rulings. What does that mean for WeWork? 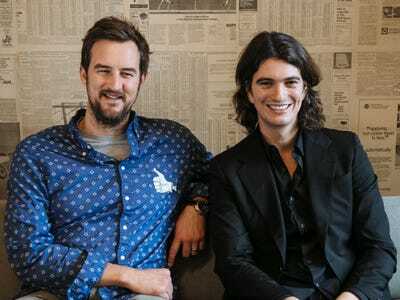 “Because the settlement offered by the NLRB requires that WeWork eliminate their class waiver and arbitration agreement, I do not anticipate they will accept the settlement terms, and I expect a complaint will issue,” Zoumer’s attorney, Ramsey Hanafi, told Business Insider. The Employer violated Section 8(a)(1) of the Act by maintaining an Invention, Non-Disclosure, and Non-Solicitation Agreement that includes a confidentiality provision that classifies personnel data as proprietary information. — MERIT.